Dhirshan Gobind apologises for reminding fans of the horrendous season under Allister Coetzee. Do YOU have any thoughts or images from the world or sport? If so, email Sport@news24.co.za and we'll hit the publish button! The decision to appoint Adriaan Strauss as Springbok captain has gone down well with Sport24's readers. With Rio 2016 a mere three months away, SASCOC has still not budged with regard to our men's and women's hockey teams. Blitzboks certain of a medal in Rio? Fans have expressed their anger at the latest Springbok Rugby World Cup jersey which has gone on sale. Whiteley on the verge of breakdown? Trevor says Lions captain Warren Whiteley faces the possibility of 'burning out' from playing too much Super Rugby. Rocco outlines why cricket quotas at national level should be scrapped...and why they should be implemented in junior cricket. Where will KP fit in? Richard has a few theories on where Kevin Pietersen will feature, if he is makes a return to the England cricket team. Sport24 reader Dhirshan Gobind predicts more doom and gloom for the Springboks in the remainder of the Rugby Championship. Jantjies 'falcons' skipper Strauss - WATCH! Dhirshan Gobind fears the worst for the Springboks in the upcoming Rugby Championship, but has a 5-point plan for coach Allister Coetzee. Sport24 reader Dhirshan Gobind details his blueprint for making South African football great. Sport24 reader Dhirshan Gobind weighs in the the latest bombshell to hit South African sport. Francois Marais says the All Blacks are light-years ahead of the Springboks in the way they manage their players on and off the pitch. Sean says Handre Pollard is the only threat the Bulls pose in their arsenal for the Super Rugby clash with the Stormers. Derby: Bulls to repeat history? Michael Engelbrecht says South African rugby players have been treated unfairly by SANZAR'S judicial board in recent weeks. Julius hopes Manchester United can continue their impressive form in the league with a win against Chelsea. THOSE Rio outfits! Oh my greatness! Whoever made the final decision for the clothing and other apparel (golf bags) for the SA Olympic team should be fired, says Patrick Busschau. Fans have overwhelmingly suggested that the Springboks' defeat to Ireland is sadly a sign of things to come. SANZAAR fan survey: Have your say! 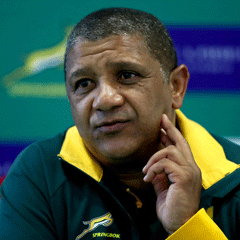 Sport24 reader Dhirshan Gobind says SA's fanatic rugby fans need to exercise patience following the appointment of Allister Coetzee as Springbok coach. So it seems the Springbok logo is under threat yet again. Dhirshan Gobind begs the ANC to ‘strike’ this off their wish-list. Hennie says the Lions on paper pose more of a threat to the Cheetahs ahead of their Super Rugby clash. Ex -schoolteacher Rodrick says quotas has no place in school sport and that children should be encouraged to do their best. Horn and Proteas: Plot thickens? A number of Sport24 readers have hit back angrily at Ali Bacher questioning CSA CEO Haroon Lorgat regarding the sms-gate saga. Jaco says Cricket South Africa needs to be honest on topic of quotas, amid a public outcry of non-transparency.